Learn more about Patterns of Power Top Ten Mentor Text Grade Level Sets. This book offers teachers practical, classroom-ready advice to take their teaching of conventions to the next level. 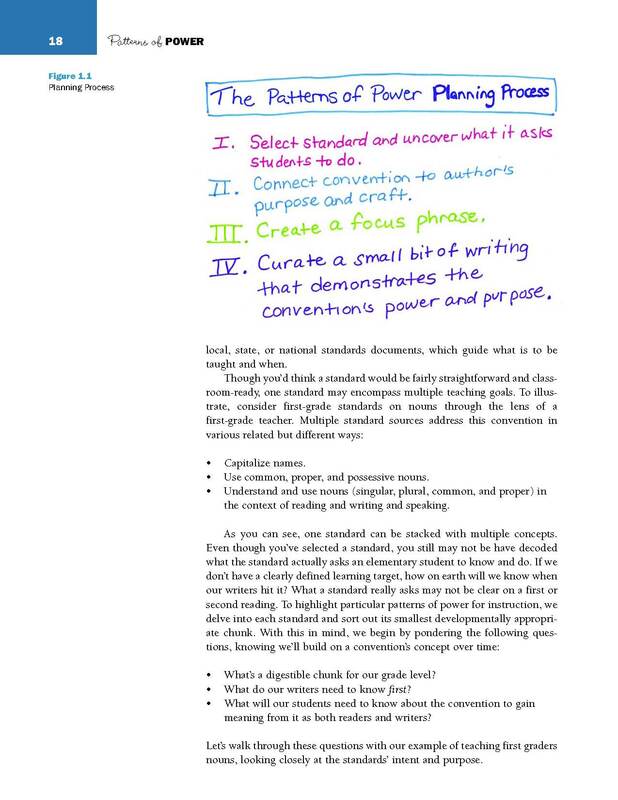 Whitney and Jeff offer planning moves to teach students about any convention, and dozens of lessons that are already planned...the advice they give is to always connect the teaching of conventions to craft and style, not just to memorize rules. Watch Jeff Anderson and Whitney La Rocca, coauthors of Patterns of Power, as they work in real classrooms to create sustainable instruction in the area of grammar and conventions. Introduction: Where Do Reading and Writing Meet? Chapter 1 Into Planning: What Do You Need to Do Before Teaching the Invitations? Chapter 2 Into the Classroom: How Do You Teach Conventions with the Invitations Process? Chapter 3 Into Application: How Do You Ensure Writers Apply What They Know? The Power of Sentences: Why Do Writers and Readers Use Sentences? Chapter 4 What Do Capital Letters Do? Chapter 5 What Do Nouns Do? Chapter 6 What Do Verbs Do? Chapter 7 What Do Sentences Do? Chapter 8 What Do End Marks Do? The Power of Pairs: Why Do Writers Use Pairs? Chapter 9 What Do Apostrophes Do? Chapter 10 What Do Pronouns Do? Chapter 11 How Do Verbs and Nouns Agree? Chapter 12 Which Punctuation Comes in Pairs? The Power of Details: How Do Writers Add Detail to Their Sentences? Chapter 13 What Do Adjectives Do? Chapter 14 What Do Comparatives and Superlatives Do? Chapter 15 What Do Adverbs Do? 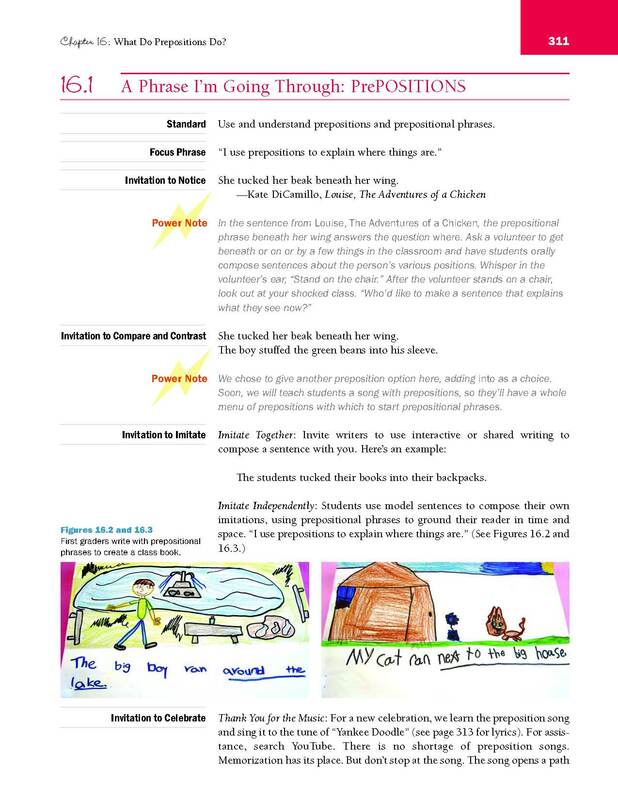 Chapter 16 What Do Prepositions Do? The Power of Combining: Why Do Writers Combine and Connect Words and Sentences? Chapter 17 What Do Conjunctions Do? Chapter 18 Why Do Writers Use Compound Sentences? Chapter 19 Why Do Writers Use the Serial Comma? Chapter 20 Why Do Writers Use Complex Sentences? Jeff...has been my go-to person when it comes to teaching grammar and conventions for as long as I can remember. His work has shown me how studying well-crafted sentences helps students understand the power of conventions in their reading and writing...This book will help us all become better teachers of writing.